Right now J and I are probably driving up I-35 on our way to Southlake, Texas to attend a 2 day marriage conference (seminar, whatever you wanna call it), or we’re already sitting in the church conference area listening to one of the speakers. More than a few people hear “marriage conference” and think, “oh, you poor thing” or “yikes”, but in reality this is something that J and I both wanted to do before we get married in just over 3 1/2 months. Not because there is anything wrong, but because we want to go into this marriage thing with all the tools and all the knowledge we can to keep it good. Makes sense, right? 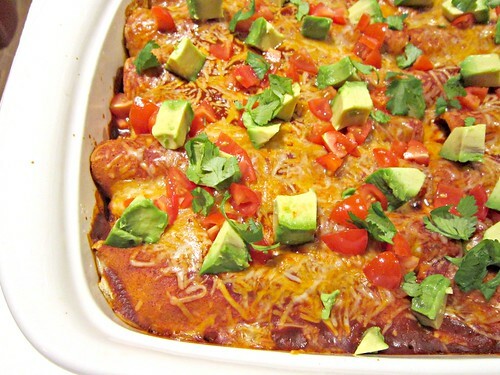 Another thing that makes sense are these enchiladas. I told you a couple of weeks ago that with a freezer full of venison, I was thinking of all the ways I could use it; all the recipes I could sub it into. Well, these enchiladas were one of those sub recipes. J and I love the beef version, so with a few tweaks, we had an equally delicious venison version of enchiladas. Same red sauce, same toppings, mostly the same seasonings. Add a little vinegar to soften the gamey taste and, voila! Enchilada win! Mmm…fresh out of the oven, cheesy and begging to be eaten. But wait…there’s more!! Avocado, tomato, and cilantro – yes, please!! It’s funny because, traditionally this would NOT be accepted as Mexican fare. Hell, even I would have scoffed at it back in the day. But you guys…it’s so good! Just think of it as extra chunky avocado salsa. Minus the onion. Blech. Of course, we had to put some homemade salsa on top as well, it just wouldn’t be right without it. I won’t tell you what I usually put on my enchiladas. You may commit me to a psych ward, and then J would starve to death. We can’t have that now, can we? So, let’s just pretend that I only ever put salsa on my enchiladas. If you like venison, you will love these venison enchiladas. 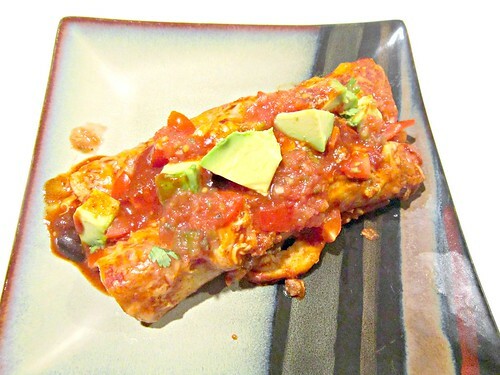 All the glorious flavors of traditional enchiladas with a leaner meat and a little gamy kick! 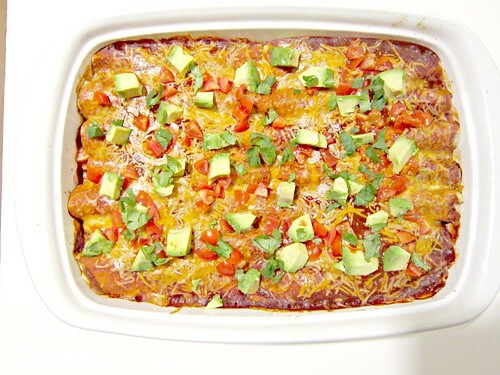 Preheat oven to 375 degrees F. Pour 1 cup of enchilada sauce in the bottom of a 9×13 baking dish and set aside. Heat olive oil in a saucepan over medium high heat. Add ground venison and cook until browned, about 3-5 minutes, using a spatula to crumble beef as it cooks. Add water, vinegar, seasonings, and beans. Reduce heat to medium-low, stir, and allow to simmer for at least 5 minutes. Remove from heat and drain any excess fat or liquid. Stir in cheese and mix well. 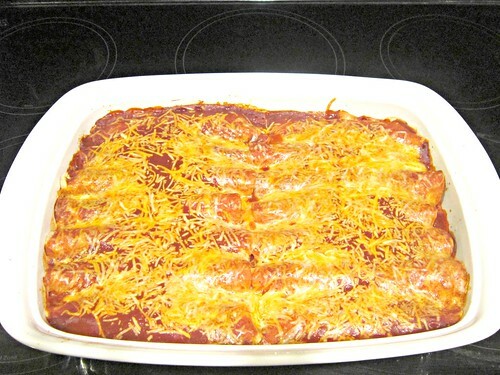 To assemble the enchiladas, lay tortilla on a flat surface and spoon 1/4 cup of the venison mixture in the center. Roll the tortilla and place seam side down onto prepared baking dish. Repeat with remaining tortillas and beef mixture. Top with remaining enchilada sauce and cheese. Place into oven and bake until cheese and sauce are bubbly, about 20 minutes. Top with cilantro, avocado and tomato and serve immediately.